A floppy bunny and his furry (and feathered!) 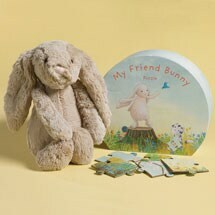 friends frolic in a springtime meadow on our adorable My Friend Bunny Puzzle. The 35-piece puzzle features oversized (roughly 3"-square) pieces just right for little hands, and a bright, joyful illustration. 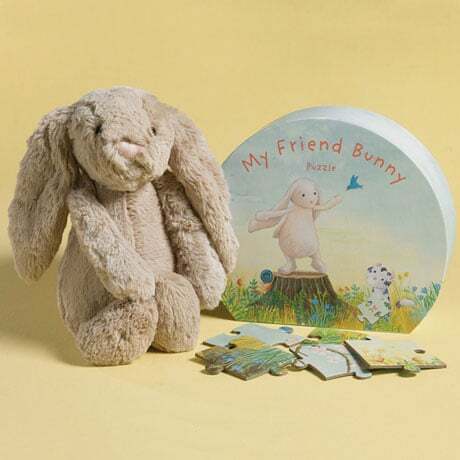 And our huggable My Friend Bunny Plush is the perfect companion, from his puffy white cottontail to his fuzzy pink nose. The puzzle is appropriate for ages 3 and up; the plush (100% polyester) will delight all ages!